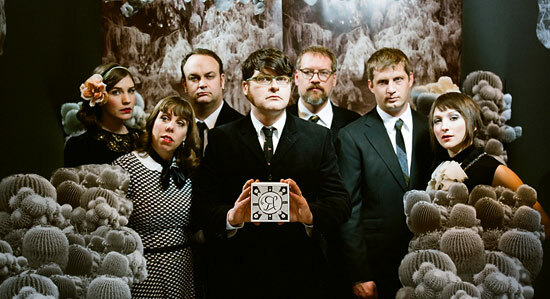 The Decemberists revealed their brand new video yesterday! I wrote “Calamity Song” shortly after I’d finished reading David Foster Wallace’s epic Infinite Jest. The book didn’t so much inspire the song itself, but Wallace’s irreverent and brilliant humor definitely wound its way into the thing. And I had this funny idea that a good video for the song would be a re-creation of the Enfield Tennis Academy’s round of Eschaton — basically, a global thermonuclear crisis re-created on a tennis court — that’s played about a third of the way into the book. Thankfully, after having a good many people balk at the idea, I found a kindred spirit in Michael Schur, a man with an even greater enthusiasm for Wallace’s work than my own. With much adoration and respect to this seminal, genius book, this is what we’ve come up with. I can only hope DFW would be proud.